UPDATE: Last few days to enter! 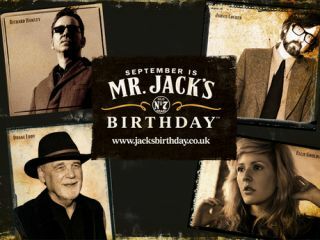 September is Mr Jack's Birthday and this year the good folk at Jack Daniel's are bringing Tennessee to town with a month of fantastic giveaways and an exclusive gig featuring Jarvis Cocker, Richard Hawley, Ellie Goulding and Tennessee guitar legend Duane Eddy. In addition to their original material all four will bring the spirit of Tennessee to life when they perform a Jack Daniel's birthday exclusive of very special collaborations themed around great Americana classics. Jack Daniel's long standing association with music began in the late 1800's when he created a band of musicians that performed to crowds of people around the state of Tennessee, the home place of Jack Daniel's whiskey. We have tickets for you and a friend to attend this exclusive gig, which takes place at The Clapham Grand in London on 7 October as well as a guitar signed by all the artists. The prize includes accommodation and and £100 travel allowance per person. To enter, just answer this question: In which US state is the home place of Jack Daniel's whiskey? Entrants must be over 18. T&C's apply. Competition deadline is Friday 24 September. Make Mr. Jack's Birthday a memorable one. Please drink responsibly. For more information on the 'Tennessee Is Coming To Town' Birthday gig go to www.jacksbirthday.co.uk. The promotion is open to UK residents aged 18 or over only excluding employees of the promoter, MusicRadar, their families, agents and anyone else connected with the promotion. No purchase necessary. To enter, input your answer with your name, age, address and telephone number here. Entries to be received no later than 24 September 2010. The promoter accepts no responsibility for any illegible entries or those which are delayed or not delivered. Proof of posting is not proof of delivery. There is one prize: a one day trip for the prize-winner and one guest to London to enjoy the Jack Daniel's Birthday celebrations. The prize includes one night's accommodation in a 3 star hotel, £100 towards travel expenses per person and free attendance to the Birthday 'Tennessee Is Coming To Town' Gig on Thursday 7 October 2010 at the Clapham Grand, London. Hotel rooms will be based on two people sharing. The hotel will be booked by The Promoter and details will be provided when the prize winner is notified. The promoter will issue a cheque written out to the competition winner for travel expenses, £200. All travel-related administration is the responsibility of the prize-winner and guests. The performance line-up may be subject to change. The Winner [and guest] will be bound by the terms imposed by any third parties providing services as part of the prize. The Promoter cannot accept responsibility for the acts or omissions of third parties. The prize-winner and their guest will need to confirm they are over 18 before taking up the prize. The promoter reserves the right to select alternative winners, should the original winner and guest not validate all of their identity and age within 3 days of notification or if the original winner is unable to attend the Birthday gig. The prize draw will be supervised by an independent person and will take place on 27th September 2010. The prize-winner will be the first name drawn at random from all valid entries. The prize-winner will be notified within 3 days and receive further details of their prize within 5 days of verification of their age, as required above. . The winners' details can be obtained for 6 weeks only by sending an sae to "Jack Daniel's / [Music Radar] Birthday gig prize draw", Spring PR, 12 Melcombe Place, Marylebone, London, NW1 6JJ. The prize-winner and guest may be required to participate in future publicity. Each prize is as stated, is non-transferable and there is no cash alternative. The promoter reserves the right to withdraw or amend this promotion in the event of any unforeseen circumstances outside its reasonable control with no liability to any entrants, the prize-winner or any third party. The promoter also reserves the right to award an alternative prize of equal or greater value, should the advertised prize become unavailable for any reason. The decision of the promoter in all matters is final and no correspondence will be entered into.Entrants are deemed to have accepted these terms and conditions by participating in this promotion. Promoter: Brown-Forman Beverages Europe, Ltd, 45 Mortimer Street, London, W1W 8HJ. Make Mr Jack's Birthday a memorable one. Please drink responsibly.